In order to meet the challenges of tomorrow, MET Institute of Pharmacy (MET IOP) organised a one-day seminar on January 5, 2008, at MET Complex. MET IOP arranged this event for all students and academicians of Pharma colleges for better understanding in the field of Pharmaceutical Sciences. The seminar was specially organised to shed light upon the changing aspects of the field. “The Institute pursues the philosophy of perpetual acquisition of knowledge. Apart from academic curriculum, our policy has been to provide value based education and to expose the hidden potential in the students. Our aim is not to make the students mere job-seekers but to make them the architects of their future. 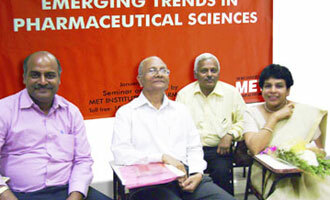 The seminar was a step in this direction,” said Dr. U B Hadkar, Director – MET Institute of Pharmacy. Seminar covered talks by prominent experts on pertinent subjects like Novel Drug Delivery Systems, Molecular Modelling, Colon Drug delivery system, Challenges in Radiation Biology, Cancer Chemotherapeutics, Patents and many more. Eminent speakers were: Dr. B N Pandey from BARC, Dr. Alka Mehta, Head Intellectual Property Cell - Cipla, Prof. Evans C. Coutinho from Bombay College of Pharmacy, Dr. S. G. Deshpande – Ex Principal from C U Shah College of Pharmacy and SNDT Women’s University, Dr. Evans C. Coutinho – Professor from Bombay College of Pharmacy, Prof. (Dr.) Krishna R. Iyer from Bombay College of Pharmacy and Mr. Binoj C. Kutty – Senior Research Fellow from Department of Radiation Biology and Health Science Division BARC. Aim is to get new drug molecules with better target specificity and decreased side effects. Computer aided drug design programmes could work in combination with softwares, which can predict the ADME characterstics of a new chemical entity and help in selection of right candidates for further development. Also, suggestion of synthetic pathways for the promising candidates can help in fruitful discovery of new drug molecule. Novel Drug Delivery System can be designed to ensure delivery of drug at site of action, better bioavailability and minimum side effect. Colonic Drug Delivery System is used for the delivery of the drug into the colon and is suitable method for oral delivery of peptides and proteins and also for treatment of colonic cancer. Improvement in techniques such as use of conformal RT, radioactive implants and intensity modulated RT and use of radio protecting agents can help to reduce the damage to normal cells. In-vitro cancer chemotherapeutic research using human cells is complicated and time consuming and in certain cases can be replaced by model organisims such as Yeast. Any invention, technique, process, molecule etc. that is new or has non – obvious use etc. can be field for patent with appropriate claims. This helps to protect the rights of the inventor for a period of 20 years. It is a territorial right.